COPD or chronic obstructive lung disease is a progressive lung disease caused as a result of chronic inflammation of the lungs with obstruction of air flow in the lungs. There is progressive lung damage over a period of time which later makes the patient “hard to breathe”. 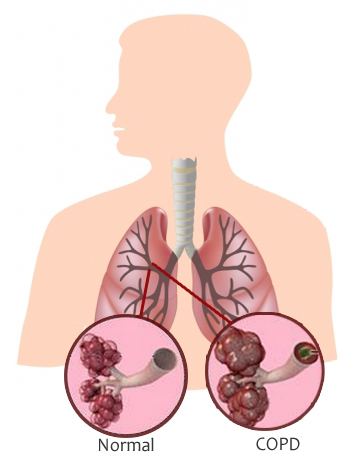 COPD is known to be a deteriorating disease. Individuals who are chronic smokers and tobacco chewers are more prone to contract this disease. Other factors include occupational exposure to irritants and pollution. Medications do help in resolving the acute attacks and chronicity of complaints. But supplementing exercise with medication accelerates the process of recovery. There are many reasons why an individual suffering from COPD should exercise daily. Exercise and COPD are interrelated. Patient does generally complain of shortness of breath on exercising. But exercising for COPD is a must. It is “WORTH GIVING A TRY”. Aerobic exercises (‘Aero’ means air) are mainly advisable and effective in enhancing the lung capacities. Aerobic exercises are active exercises which help one “breathe easy” due to a good amount of oxygen intake in the lungs. Yogic exercises and Pranayam help build the lung strength and keep them healthy. They help to improve oxygenation as well as endurance of the heart and lungs. Reason 1: Breathing exercises help body use more oxygen efficiently and thereby improve your breathing with time. Reason 2: Strengthening exercises help tighten the involuntary as well as voluntary muscles of the upper body thereby help in maintaining the tone of the breathing muscles. This will prevent easy tiring while performing any physical activity. Reason 3: Aerobic exercises help you in “BREATHING EFFORTLESSLY”. It decreases shortness of breath and easy fatigue thereby improving your stamina. Reason 4: Exercising within the group makes you feel lively. It helps in socializing which further motivates you to build a positive attitude towards resolving your illness and be regular in exercising. Reason 5: Warm up helps in improving blood circulation thereby improving oxygen supply to the lungs and heart. This further improves the elasticity of lung tissue.